The weather in Michigan has been completely insane this spring. And when I say insane — I mean INSANE! This past weekend we have snow! Not just a light dusting of snow that melted once it hit the ground, we had snow that stuck to the ground until at least the next afternoon. I cannot remember a time where it was the end of April and we have to have our heat cranked as high as we do in the beginning of January. I can truly say I am ready to skip spring and move right into summer!! Since our “winter” is lasting longer than expected it has given me some extra time to enjoy the foods I normally only make during the cold months here in Michigan. I know, I know — there is nothing good about this weather but at least I am trying to find the positive side of it!! 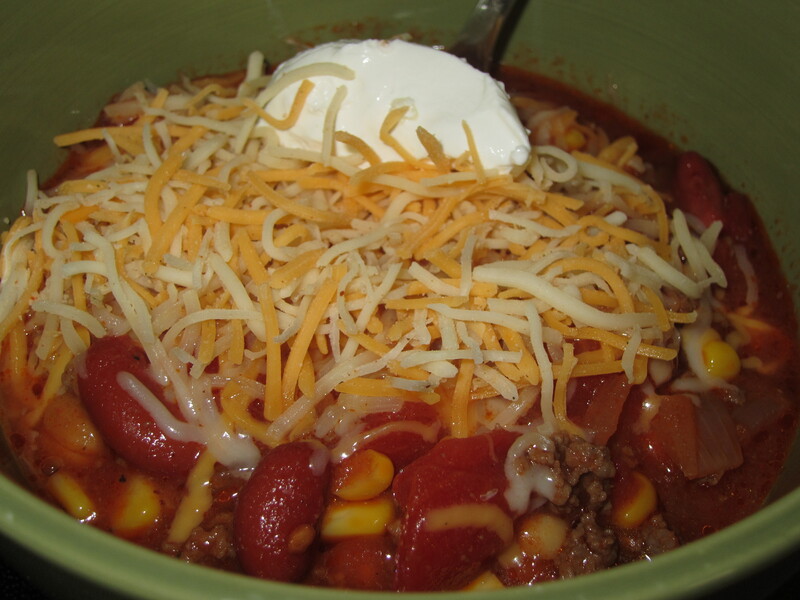 One of my favorite winter dishes is Taco Soup. This dish reminds me of some of my greatest childhood memories each and every time I make it. 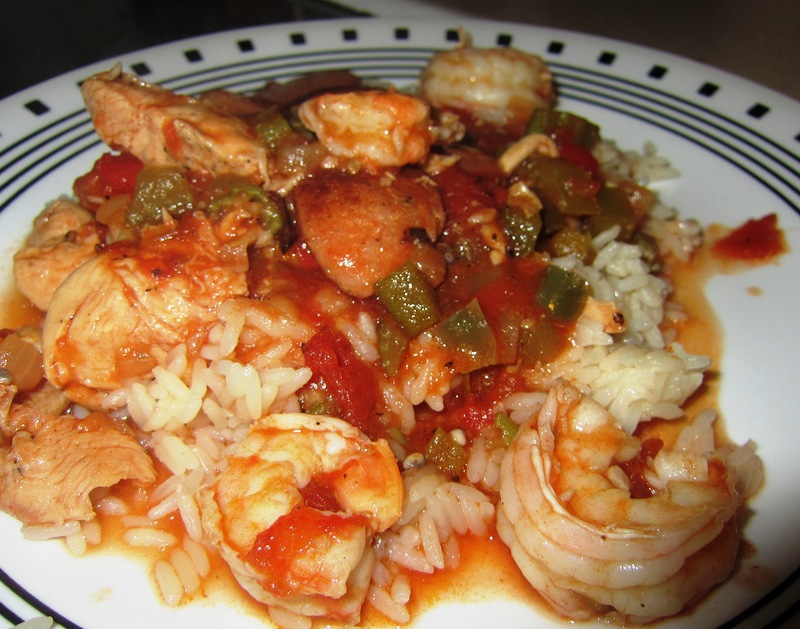 This recipe comes from my Grandma Shrader, which I have adapted to cooking style — a little more hearty with much more meat. Every winter break when my sister and I would go stay with my Grandparents when we walked in the door Grandma always had a large-steaming pot of Taco Soup there waiting for us. This soup is what I call a “Mexican” like chili. I top it with some shredded cheese and sour cream right when serving it, and it goes great with tortilla chips. So, if you are experiencing cold weather longer you thought you would and are looking for a warm-hearty dish — give this Taco Soup a try!! 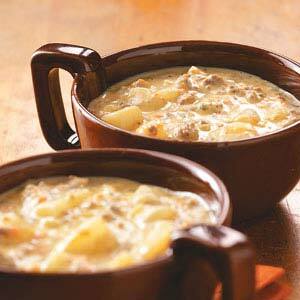 In a large stock pot or Dutch oven, over medium heat cook the ground beef and onions until the beef is browned. Once the ground beef is cooked and in one package of the taco seasoning and mix well. Add the diced tomatoes, garbanzo beans, kidney beans and the remaining packages of taco seasoning to the pot. Stir well to combine. Depending on how hearty you want your soup add 1/2-1 can of the tomato juice (I add the whole can). Over medium heat bring the mixture to a light simmer and cook, covered, for 20 minutes. Serve warm with shredded cheese, sour cream and tortilla chips if desired! Note: If you like your soup a little on the spicy side feel free to add 1 teaspoon of Cayenne Pepper. Source: adapted from My Grandma Shrader! Winter is official here and that means it is time to break out all of the soup dishes I have been dying to make all year long! This past week we have been experiencing temperatures of the subzero kind. Talk about freezing! Our poor little pugs get this sad look on their face every time we tell them it is time to go outside, poor dogs!!!! When I think of weather this cold I instantly think of soup, and not just any soup – comfort soup! Comfort soup to me means a think and hearty soup, not a broth based chicken noodle! Nothing makes me feel better on a cold winter night than eating a hearty bowl of stick to your ribs soup! This is definitely what I would call comfort soup! It takes one of Mark and I’s favorite food, Cheeseburgers, and transforms it into a creamy, cheesy, flavor-packed soup which warms your entire body and leaves you craving more. It is AMAZING and has become a favorite around our house! In a large stock pot, brown the ground beef and onions together until meat is cooked and the onions are tender, then drain the grease out of the pot. Stir in the basil and the parsley. Add the potatoes and chicken broth into the pot and bring the mixture to a boil. Once boiling, turn the pot down to a simmer and cook until the potatoes are soft. Once the potatoes are soft, add the Velveeta cheese, milk and salt/pepper to taste. Turn the heat down to low and stir until the cheese is all melted. Once the cheese is melted allow the soup to cook on low for 5 minutes before serving! Source: adapted from She Who Makes.